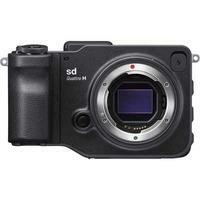 With an incredible 51-megapixel-equivalent resolution, the Sigma sd Quattro H is the first camera to feature the newly-developed APS-H size Foveon X3 Quattro direct image sensor, which delivers images with rich tones, gradation, and texture. It offers exceptional realism, and features accurate, smooth, and fast autofocusing with a combination of phase and contract detection AF systems. Li-ion Battery Pack BP-61, Battery Charger BC-61, AC Cable of Battery Charger, USB Cable, Strap, Body Cap, Instruction Manual, Limited Warranty and Warranty Sticker.